Walking Distance: 1 Mile of walking with short drives between stops 3-4 and another from stops 12-14. Best Time To Go: Tuesday-Sunday while the museums are open. Home to many of the early mill industry barons, the Washburn-Fair Oaks neighborhood was once home to the biggest mansions in Minneapolis. Most of these huge mansions were built from the late 1800s through early 1900s and housed famous families such as the Pillsburys, the Turnblads, and of course the Washburns. Amassing tons of wealth, many of the families took over complete blocks of the community with each new generation building neighboring mansions in an effort to out do their parents. While many of the mansions are now long gone there are a couple clusters of them that are impressive to see. Hope you enjoy our Washburn Fair Oaks Mansions Walking Tour! 1. Van Dunsen Mansion (1900 Lasalle Avenue): This huge Richardson Romanesque-style Mansion was built in 1892 for George and Nancy Van Dunsen who got rich off the grain industry. At the height of their business the Van Dunsens controlled 300 grain elevators across the Midwest which stored grain along railroad lines. Because of their extreme wealth the Van Dusens went all out with their huge 12,000 square foot castle-like stone mansion with everything from the best wood interior, a carriage house, and even a slate roof. 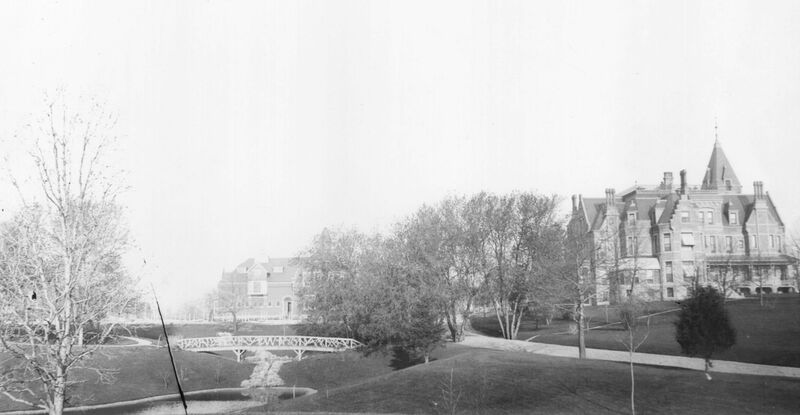 After the Van Dunsens pasted away in the 1940s the mansion went on to house the College of Commerce, the College of Medical Technology, the Horst Institute, and the Hamline Law School over the years. Even with colleges coming in and out the mansion still fell into despair and in 1995 was just days away from being tore down after years of being abandoned when a businessman from LaCrosse bought it at the last second. The Van Dusen Mansion was in such rough shape when the new owners moved in that it required almost $5 Million to renovate, but today it is as amazing as ever. The red-brick Van Dunsen Mansion is now one of the top places for VIP meetings and weddings around the Twin Cities. Historic Photos: (The Home In 1894 | 1962 When It Was the College of Medical Tech). Mansion Website: (HERE). 2. Semple Mansion (104 West Franklin Avenue): Even cooler than the Van Dunsen Estate you just saw is the nearly 20,000 square foot Frank Semple Mansion. The Semples got rich from owning the largest Hardware Warehouse in the Northeastern United States before retiring to Minneapolis. The Mansion was completed in 1901 but Frank only got to live here for 3 years before he died in 1904. While the large home may not have the castle-like charm of the previous mansion, to us the style they used just screams charm. The Semple family choose the elegant Second Italian Renaissance Revival-style to model it after mansions they saw on their frequent trips to Europe. In the decades since the last of the Semples moved out the mansion has been many things including offices and even a bank in the 1960s. The actual bank vault was found in the basement during renovations and has been turned into a Wine Grotto with hanging grapes and classic frescoes. The majority of the Mansions’ third floor holds the Grand Palladian Ballroom, which is the largest original residential ballroom in Minnesota. We really love the 1000 square foot living room complete with a fireplace mantle shipped from an 18th century European manor. Today the restored Semple Mansions hosts weddings, receptions, and even has a custom bridal suite. Photos: (Semple’s Hardware Store 1888 | The Home In 1910). Mansion Website: (HERE). 3. George Newell House (1818 Lasalle Avenue): Although it doesn’t host weddings like the other large mansions you just saw, we really like the George Newell House. This mansion was built for Sumner T. McKnight in the Richardson Romanesque-style in 1888. McKnight only lived here for a short period of time before he quickly sold it to the upstart George Newell. Newell had a ton of fresh money burning holes in his pockets after starting the large grocery company Stevens, Morse and Newell in 1887. While you may not recognize the name of Newell’s company, it ending up becoming Supervalu when Newell’s son took it over in 1921. Supervalu went on to become a regional powerhouse grocer and got later got into food distribution. At one point in the early 2000s they were supplying large grocers such as Festival and many Target stores. Historic Photos: (Mansion in 1974). 4. Caroline Crosby House (2105 1st Avenue South): John Crosby built this large mansion for his daughter in 1900 and it was impressive enough that Luther Farrington built his home in the same style next door (2100 1st Ave) just six years later. Crosby was a local miller who partnered with the Washburn brother’s large milling operation in 1877 to help consolidate their efforts into the Washburn-Crosby Milling Company. The men quickly perfected their flour products and in 1880 won gold, silver and bronze medals at the first International Millers’ Exhibition in Cincinnati, Ohio. This victory truly established their company with World-wide exposure and their Gold Medal flour is still the #1 flour in the United States. The company continued to consolidate with other mills an became the Minnesota Milling Company. In 1928, the Minnesota Milling Company joined with 28 other mills to form General Mills which is still one of the biggest grain companies in the World. Historic Photos: (Caroline Crosby in 1922). 5. Former Old Pillsbury Mansion (2200 Stevens Avenue): Business savvy Charles A. Pillsbury followed is uncle John Sargent Pillsbury to Minneapolis in 1869 to help him lumber mill. Previous to Charles showing up most of the mills had cut throat competition in everything from getting their power to selling their products. He quickly saw the opportunity for all mills to do better and worked with his competition including the Washburn Company to form a miller’s buying pool so they could better invest in innovations. Charles’ hard work paid off and just 3 years after moving to Minneapolis he founded the C.A. Pillsbury Company kicking off a rush of mills switching from lumber to flour. As part of his start up Charles got $10,000 from both his father George and his Uncle John Sargent Pillsbury as partnership buy ins. Charles used the money and invested a new type of machinery that split hard spring wheat into flour which them a huge advantage over all the other mills. This advantage helped the company boom and they quickly had one of the largest milling operations in the entire World. Just 5 years after forming the C.A. Pillsbury Company was so popular that we was elected to the Minnesota State Senator in 1877 where he served for 20 years. With money flowing in Charles had a huge home called the Old Pillsbury Mansion built where the church now sits that was said to be the most beautiful in the neighborhood. Unfortunately the Old Pillsbury Mansion became one of many local mansions that fell into shambles during the Great Depression and has since been tore down to make way for the church. Today the Pillsbury company that Charles started is still has successful lines and is known World-wide by their popular mascot the Pillsbury Doughboy. Historic Photos: (Mansion in 1900). 6. Charles Pillsbury Jr. House (100 East 22nd Street): When Charles A. Pillsbury died in 1899 he left the Old Pillsbury Mansion (2200 Stevens Avenue) to his wife and twin boys Charles S. Jr and John S. Pillsbury. When their mom died there was some drama between the boys on who would inherent the family home so they decided to settle it on a coin flip. John won the toss which motivated Charles Jr to start building an even bigger house across the street (100 East 22nd Street) which he finished in 1913. Charles Jr lived in the huge limestone mansion you see today with his beloved wife Nellie Winston. The 3 story mansion is 20,000 square feet and has stone fireplaces takes from 3 different 1600s English cottages. Today the mansion houses the offices for BLIND (website), an organization helping blind residents of Twin Cities. Probably the most impressive Pillsbury home of all the the vacation home the boy built in Orono Minnesota in 1918. Known as Southways Estate (1400 Bracketts Point Road), the 32,461 square foot mega mansion is worth in upwards of $50 million. 7. Alferd Fiske Pillsbury House (116 East 22nd Street): Charles’ uncle John came to Minneapolis in 1855 to get into Lumber Milling near St Anthony Falls. Because of John’s success milling his nephew Charles followed in 1869 to get in on the action. Just 3 years after getting to town Charles was already in business for himself, but let his dad George and uncle John both buy into the C.A. Pillsbury Company for $10,000 which started the Pillsbury empire. Maybe John’s biggest life event came just four years later when he was elected as the 8th Governor of Minnesota (1876-1882). When uncle John died in 1901 he left his part of the Pillsbury fortune to his son Alferd Fiske and daughter Sara Bell. Alfred loved spending money and quickly started work on the English Gothic house you see before you. The home is considered to be in the Tudor revival and Alferd picked every detail even having a library from a 18th Century English cottage dis-assembled, shipped to Minneapolis, and re-rebuilt. Although he served in title as the vice-president of the family business, Alfred never cared much for milling and was more interested with art. He collected from all over the World especially paintings and jade from Asia. When Alfred died in 1950 he willed his entire 900 piece art collection to the Minneapolis Institute of Arts (mentioned below). Many of the works from Alfred’s collection are still on display today. 8. Gale Mansion (2115 Stevens Avenue): Attorney Edward Chenery Gale was the son of a rich real estate investor who married into even more money when he wed uncle John Pillsbury’s daughter Sara. The couple traveled extensive through Europe which inspired the look of their Italian Renaissance Revival style mansion which was completed in 1912. The Gales really liked the details in the English-stlye mansion Sara’s brother Alferd had next door so they hired the same guy to build their home as well sparing no expense. They had a pipe organ in the great room, a walnut staircase, ornate ceilings, central vacuum system, intercom, and 8 extremely detailed fireplaces to name a few things. While their life style and lavish home may make the Gales appear snoody, they we actually very involved in giving back to the community. One of the couple’s biggest efforts was to be leaders in the development of the nearby Minneapolis Institute of Arts which opened in 1912, the same year their home was completed. Even after their death Edward and Sara were helping the community as their home became the Minneapolis Branch of the American Association of University Women (AAUW) for 30 years starting in 1947. Since then the amazing home have been restored to its original splendor and now serves as one of the top wedding venues in the Twin Cities. Historic Photos: (Mansion in 1965). Mansion Website: (HERE). 9. Eugene Merrill House (2116 2nd Avenue South): This red stone, Richardson Romanesque home was built in 1884 for the baker and lawyer Eugene Merrill. It is the oldest surviving large mansion in the neighborhood and now serves as a lawyer’s office. 10. Washburn Park (formerly the Fair Oaks Estate): Lawyer William Washburn started getting rich by helping his brother Cadwalader Washburn start up a flour milling company 1856. Cadwalader, who was a Wisconsin politician and businessman, funded operations while William worked locally in Minneapolis to make the business grow. Just 10 year into operation they built a huge mill called Washburn A and then biggest mill anywhere in 1874 called Washburn B. Their Washburn B mill became famous not just for its massive flour output, but also for a huge flour dust explosion 4 years into operations which blew up parts of the building killing 18 people. The ruins of Washburn B are a highlight of our Riverfront & Mill District Walking Tour. Even with the 1878 explosion and troubles the Washburn milling operations continued to boom as they bought out smaller mills. In 1883 William used some of his wealth to build a huge family mansion called Fair Oaks Estate which stood where the Washburn Park sits today, photo. Washburn named his estate Fair Oaks after the dense 10 acre oak grove that covered the property when he bought the land. William loved the lush oak grove and turned his lawn into a park of sorts with ponds, bridges, and greenery. The 1880s were great for Washburn not just in business, but also in political as he was elected to Congress and later the Senate. When we died, Washburn left his estate to the City of Minneapolis, but they found it too expensive to maintain and sadly torn it down in 1924. 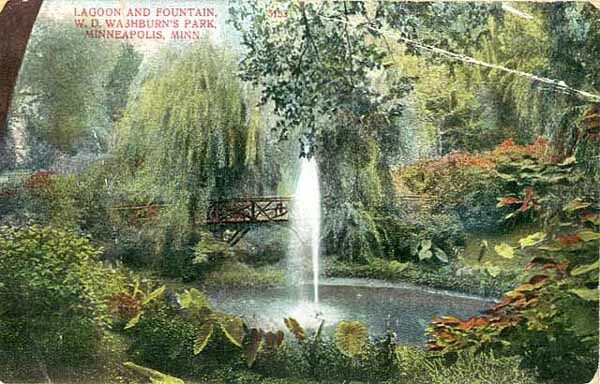 Today the park and neighborhood both bare Washburn’s name as do the radio and tv station his company later bought, WCCO. The company is best known for consolidated its milling companies as General Mills which is still one of the biggest grain companies in the World. Historic Photos: (Fair Oaks Estate Mansion 1886 | Fair Oaks Estate lawn 1890 | Fair Oaks Estate garden 1910). 11. Hennepin History Museum (2303 3rd Avenue South): The little known Hennepin History Museum sits in the former George Christian Mansion built in 1919. The Museum is a unique one because it is all about local social history and is really a lot of fun if you already have a grasp on general Minneapolis history. One of the best parts of the museum is their Library which is filled full of resources and historic photos. While we believe they have some of the information on the original owner of mansion wrong, the accuracy and depth of their overall collection is very good. The only reason we bring this up is because they claim that George Christian started working for the Washburn-Crosby Company in 1866 but the company didn’t form until 1877. Small detail, but they are a museum and we have reached out to them for clarification. Did you notice the little bird house of books outside of the Museum? It is part of Free Library Project started by Todd Bol of Stillwater Minnesota that has been spreading throughout the State. It works on the honor system where you take a book but leave a book return and it is a great way to get exposed to many new authors. History Museum Hours: Tuesday-Saturday 10am-5pm; Sunday 11am-5pm; open until 9pm on Thursdays; Closed Mondays. Cost: Adults $5, Students $1. Museum Website: (HERE). 12. Minneapolis Institute of Art (2400 3rd Avenue South): Sitting in a building resembling the U.S. Supreme Court the Minneapolis Institute of Art is the only large scale fine arts gallery in the Twin Cities. It is arranged into really handy sections based not just on era, but also based on where the art came from such as Asia, Africa, ect. The build was completed in 1912 but it wasn’t until 1950 when the Institute gained its biggest prize inheriting a 900 piece collection from the death of local collector Alferd Fiske Pillsbury. The Art Institute also houses the award winning Children’s Theater Company (website) on its south side which features children performing Broadway Plays. Art Institute Hours: Tuesday-Saturday 10am-5pm; Sunday 11am-5pm; open until 9pm on Thursdays; Closed Mondays. Cost: FREE, special exhibits may charge and are typically $12-14. Historic Photos: (Art Institute In 1915). Museum Website: (HERE). 13. Bardwell Ferrant House (2500 Portland Ave): This oddly shaped home was originally built in 1883 at 1800 Park Avenue in a Queen Anne Style but was altered to the current Moorish Style in 1890. It is a little odd the style was changed on a house only 7 years old, but we really like the look. Its current Moorish style includes 2 beautiful onion domed towers and has a lot of painted, carved wood details. Not only we the owners get restless with the originally style quickly, they also got restless with location as the home was later raised and moved blocks away to the current location. Having been preserved with the move, the Ferrant House is now the oldest house still standing in this area of Minneapolis. If its getting late in the day we suggest just taking the house in while driving down Portland Avenue to the next stop as the surrounding neighborhood can be a little seedy when wondering around on foot. Historic Photos: (Rundown And For Sale In 1984). 14. American Swedish Institute (2600 Park Ave South): Born in Sweden in 1860, Swan Turnblad and his family immigrated to Minnesota when he was only 8 years old. When he turned 18 Swan moved to Minneapolis and started working as an editor for the Swedish language newspaper called Svenska Amerikanska Posten. Using his childhood experiences of poverty as motivation, it only took Tunrblad 10 years to move up the ladder and become the paper’s owner. As the owner he invested in a color printing press and started adding illustrations into his articles which made circulation boom making Swan a very wealthy man in the process. With his new fortune in hand Swan wanted to build a grand estate for his family and started by buying six lots all right next to each other in 1903. The style for the castle-like home was inspired from French Chateaus the family saw on many trips to Europe and the huge mansion took a full 5 year to finish. The end result was a 33 room castle that to this day is still one of the three coolest houses in all of the Twin Cities, (The others are Bakken in Uptown and Hill Mansion in St Paul). The most striking part of the interior is the detailed wood carvings which took 18 workers working full time to complete over the five years of construction. We really like the 11 unique tile stoves the family had installed from Sweden. Typically these stoves would have been used for heating, but since the Turnblads already had central heating installed the stoves were purely for decoration. No expense was spared in construction as the garage even had a turntable in the floor that would turn Swan’s car around after he pulled in so he never had to back out. When his wife died in 1929 Swan moved across the street with his daughter and donated their mansion, downtown apartment, and the newspaper to the American Institute for Swedish Art, Literature and Science which later became the American Swedish Institute. On a tour of the mansion you’ll love the period rooms, the museum, Nelson Cultural Center and their great exhibit gallery. The FIKA cafe (website), located onsite is considered one of the best places for lunch in Minneapolis. Our favorite times to visit the mansion are during their Midsommar Festival and the annual Crayfish dinner held in August when Sweden’s crayfish are in season. Institute & Tour Hours: Tuesday, Thursday, & Friday Noon-5pm; Wednesday Noon-8pm; Saturday 10am-5pm; Sunday Noon-5pm; CLOSED Mondays. Admission Cost: Adults $6, Teens $4, Under 6 Free. Guided Tours: Wednesday & Saturdays at 1:30pm. During normal hours you ma also take a self guided tour. Historic Photos: (The Mansion In 1905 Chauffeur Carl Lundy Waiting In the Car 1907 | Prince Of Sweden Visiting In 1958). Mansion Website: (HERE).